100 Künstler – 100 Werke. There is no need to travel to the world’s big museums to acquaint oneself with Japanese coloured wood engravings and masks from the South Seas, antiquities from Pergamon and the works of Picasso, the Viennese „Biedermeier“ or the spirit of the Fifties in Paris. 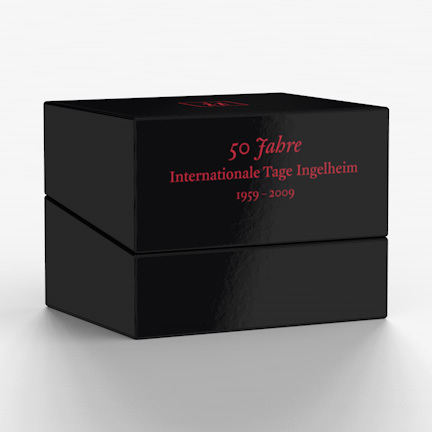 For over four decades the Internationale Tage have provided equally good insights into the art and culture of our world with the Altes Rathaus (Old Town Hall) in Ingelheim on the Rhine acting as the venue for the annual thematic exhibitions. Initialy, the idea was to provide some perspective of the life and culture of other nations and peoples in the surroundings of an international company: in 1959, the basic idea of being receptive to and learning more about other cultures led Dr. Ernst Boehringer, in his capacity as co-owner of the family-owned company Boehringer Ingelheim, to organise a festival of culture. Throughout almost three decades, the Internationale Tage team was spearheaded by Dr. François Lachenal (1918–1997). The first Internationale Tage were devoted to our neighbour France and comprised a small exhibition and a colourful programme ranging from talks to culinary specialities. The basic format for the future had been established and the Internationale Tage were destined to grow with a dynamism of their own. The exhibitions soon became the focal point of the event and in 1966 it was possible for the first time to exhibit the work of a single artist: Goya. The manifold increase in sources of information in our times nowadays demands and facilitates the organisation of carefully and scientifically researched art exhibitions and these have now been attracting the attention of international experts for some considerable time. A programme of accompanying events and the fact that the Internationale Tage have become an integral part of the culture of the region ensure that they enjoy both a large public response as well as special status throughout the whole of the Rhine-Main region.